I'm sure I'm not the only one who LOVES Mexican food. Am I right? And I am also sure I am not the only one who can't afford to go out to eat at a Mexican restaurant every night, correct? So why not give Mexican flavors a try at home? I've been making this Beefy Enchilada recipe since 2001!!!! For the life of me, I cannot figure out WHY I haven't shared this before! It's incredibly easy and, clearly, one we enjoy since I've been making it for so long. The recipe is from Quick Cooking with Karin Calloway and it looks like that cookbook can only be found used now. :( Karin is a chef and did weekly cooking tips and recipes at The Augusta Chronicle in Augusta, GA. She also had a weekly spot on a local TV station sharing recipes. Every recipe of hers I have ever tried have been so tasty!!! 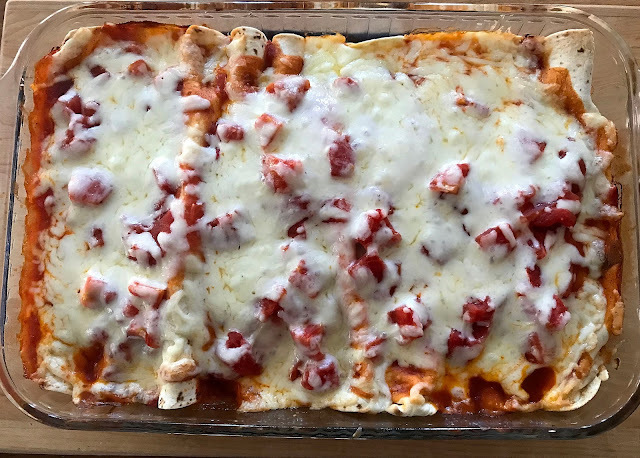 Hope y'all enjoy trying these enchiladas! Brown ground beef and drain well. Return to pan and add taco seasoning and green chiles and remove from heat. In the middle of a flour tortilla, spread 1 oz of cream cheese. Then carefully place 1/4 cup of the beef mixture down the center of the tortilla and roll up. Place in the prepared 9x13 pan. Repeat with remaining tortillas. 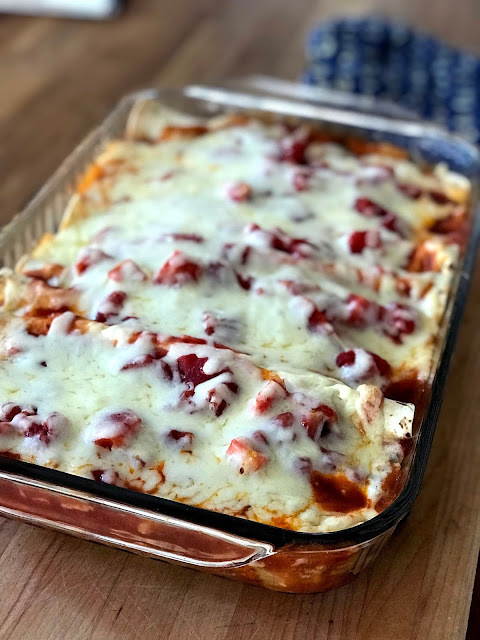 Pour tomatoes and enchilada sauce over enchiladas and sprinkle with cheese. Cover with aluminum foil and bake for 30 minutes. Remove foil after 30 minutes and bake an additional 5-10 minutes, until cheese is bubbly. Sounds delicious! I am going to look for enchilada sauce (have never bought it before) for I'd like to try this with my family. Looks good! Just the thing for a chilly winter evening. I was just looking for a recipe like this! Pinned! These look amazing and so cheesy-good! Your Enchilada's look delicious for this cold winter day! Thanks so much for sharing your post with us at Full Plate Thursday. Have a great week and come back soon! Wish I had the ingredients on hand to make for Sunday lunch! Visiting from Happiness is Homemade link party! I followed you on Pinterest and would love for you to follow me! These look really delicious. Greta recipe. Our love of Mexican food began when we lived in southern California. That love followed us to West Virginia! Thank you for sharing these recipes with us at Party in Your PJ's. I've pinned!